The theme Image Hunter transforms your site, making it fast and functional and user-friendly interface suits perfectly for image collector websites. Convenient admin interface allows fully customizing of blocks sizes and home page pictures (thumbnails are generated automatically without the assistance of additional plug-ins). Image Hunter balances this versatility with some powerful functionality including new News slide display system, category management and much more. The theme has a dedicated admin panel giving you full control over the design, information display and customizing individual modules. There are 6 advanced color schemes available for you to choose from. 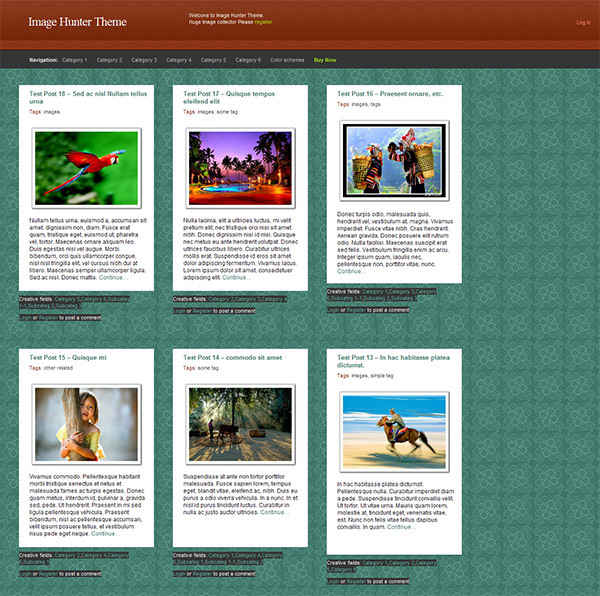 The Image Hunter theme doesn’t contain images, everything renders via CSS. This makes theme an incredibly fast, flexible and expandable theme. Customize it with just editing one single CSS file.